Family life among the drow of the Underdark is never pleasant. The spider goddess Lolth, Queen of the Demonweb Pits, encourages her dark elf followers to fight among themselves -- ostensibly to cull inferior members of their race. Should the slightest opportunity present itself, drow turn on each other without warning. The leader of a powerful house might murder his children or risk being assassinated by them in a bloody coup should he show the slightest weakness. Siblings slaughter each other in long conflicts over power and resources, sometimes destroying whole drow cities in the process. Drow families are ruled by fear, and relationships are most often marked by hatred, jealousy and greed. Akordia Pharn, priestess of Lolth, knows this truth more than most. She must fear her own child most of all -- the half-fiend daughter she named Eklavadra. Full of fear and loathing, she waits for the day when her daughter will overwhelm her and make her another sacrifice to the bloodthirsty spider goddess. A half-century ago, in the drow city of Menzoberranzan, Akordia conceived Eklavadra during the Academy's depraved graduation ceremony. As the foremost among her classmates, Akordia was given the honor of summoning the glabrezu, whose infernal presence is crucial to the graduation ritual. She remembered little beyond the summoning -- vague, horrible visions and the feeling of being engulfed by the glabrezu's foul presence blotted everything else from her memory. The unholy union left the young priestess pregnant. When Akordia learned that she would give birth to a half-fiend, she gave thanks to the Spider Goddess since few students are chosen for this honor. Throughout her pregnancy, Akordia was drunk with the anticipation of power, for Lolth clearly favored her and her house. Then, after a long and painful labor that nearly cost Akordia her life, Akordia had her child presented to her by the other priestesses. Akordia looked at the creature they laid on her stomach: It had four arms, and two of these arms terminated in oversized claws. It looked more like a beast than a drow, with a long muzzle full of tiny, sharp fangs. Akordia was filled with disgust for her child. She spoke only to name the newborn Eklavadra, after a powerful ancestor of her house, before ordering the attending priestesses to take the creature away. As Akordia watched, her demon child grew in size and power. In a few short years, Eklavadra stood 8 feet tall and could tear a drow warrior to pieces with her claws. Armed with the favor of Lolth and with Eklavadra, their living weapon, Akordia's mother and father led their house on a bloody campaign to destroy their enemies. All who opposed them fell before the draegloth's claws. Eklavadra always remained close to her mother and frequently curled up at the foot of Akordia's bed at night like a guard animal. The draegloth's constant presence made Akordia the subject of envy and fear among the drow of Menzoberranzan. Still, Akordia could barely hide her disgust beneath a thin veneer of civility. She became paranoid that the draegloth would sense her unease, but somehow Eklavadra never did. After some time, Akordia began to wonder if her daughter was something rarer among the drow than a draegloth -- a child possessed of genuinely warm feelings toward its parent. Akordia exploited this weakness, using the draegloth as her personal bodyguard and assassin. Soon, the city of Menzoberranzan learned to fear Akordia as much as her daughter. Then, one day, Eklavadra gave her mother a present. At the conclusion of a particularly terrible conflict, when all of the enemy forces were dead or dying, the half-fiend went on to butcher her grandmother and grandfather. Eklavadra laid their torn bodies at her mother's feet, proclaiming Akordia the new leader of their house. If anyone in the family objected, they said nothing for fear of Eklavadra's anger. Akordia was delighted with her new position and the power it gave her, but she could still feel nothing but revulsion for her daughter. When she learned that she was pregnant with a second child, Akordia was grateful. When she gave birth to a normal, healthy daughter she was overjoyed. But, before the child could walk, she disappeared from the family compound without a trace. Servants, speaking to Akordia in whispers, claimed they'd seen Eklavadra stalking near the nursery before the girl disappeared. Nothing could be proven, however, and not even Akordia could move against her daughter directly. After the baby's disappearance, the relationship between Akordia and Eklavadra grew colder and more distant. 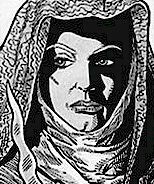 With horror, Akordia learned that Eklavadra had begun to study with the priestesses of the Academy. Until this, it was not clear who would emerge victorious should mother and daughter come into open conflict. But once her daughter mastered the dark secrets of Lolth's clergy, Akordia knew there would be no stopping her. Akordia now bides her time by hoarding magic items and waiting for the day when Eklavadra makes her move to usurp her position as leader of the house. She prays daily that her daughter will make a mistake and reveal some weakness, but she fears that the Spider Goddess has withdrawn her favor. Secretly, Akordia wonders if she ever truly possessed Lolth's favor, or if the Spider Goddess had only ever smiled upon the demonspawn Eklavadra, and had only used her as a tool to bring this twisted creature into the world. Akordia Pharn: Female drow Clr15; CR 15; Medium-size humanoid; HD 15d8+30; hp 97; Init +0; Spd 20 ft.; AC 20, touch 10, flat-footed 20; Atk +15/+10/+5 melee (1d8+4/19-20, +3 longsword); or +12/+7/+2 ranged (1d6+1, +1 sling); SA rebuke undead 10/day; SQ drow traits, SR 26; AL NE; SV Fort +11, Ref +7, Will +13; Str 12, Dex 11, Con 14, Int 11, Wis 19, Cha 16. Skills and Feats: Concentration +13, Diplomacy +10, Hide -5, Knowledge (religion) +16, Listen +6, Search +2, Spot +6; Combat Casting, Endurance, Extra Turning, Leadership, Lightning Reflexes, Martial Weapon Proficiency (longsword), Silent Spell. Spell-Like Abilities: 1/day -- dancing lights, darkness, faerie fire. Caster level 15th; save DC 13 + spell level. Drow Traits: Akordia is immune to magic sleep spells and effects, and she has a +2 racial bonus on saves against enchantment spells or effects and a +2 racial bonus on Will saves against spells or spell-like abilities. She has darkvision (120-foot range) and is entitled to a Search check when within 5 feet of a secret or concealed door as though actively looking for it. Akordia also has light blindness (blinded for 1 round by abrupt exposure to bright light, -1 circumstance penalty on all attack rolls, saves, and checks while operating in bright light). In addition, she has a +2 racial bonus on Listen, Spot, and Search checks (already figured into the statistics given above). Spells Prepared (6/7/7/7/6/5/4/3/2; save DC 14 + spell level): 0 -- detect magic (2), guidance (2), resistance (2); 1st -- cause fear (2), cloak of dark power*, detect undead, divine favor, protection from good, summon monster I; 2nd -- aid, bull's strength, clairaudience/clairvoyance*, enthrall (2), hold person, lesser restoration; 3rd -- animate dead (2), dispel magic, magic circle against good, prayer (2), suggestion*; 4th -- discern lies, giant vermin*, restoration (3), summon monster IV; 5th -- circle of doom, dispel good, healing circle, slay living (2), spiderform*; 6th -- greater dispelling, harm, planar ally, spider curse*; 7th -- blasphemy, summon monster VII, word of chaos*; 8th -- greater planar ally*, summon monster VII. *Domain spell. Deity: Lolth. Domains: Drow (Lightning Reflexes as bonus feat), Spider (rebuke/command spiders 6/day). Possessions: +3 chainmail, large steel shield, +3 longsword, +1 sling, sling bullets (20), backpack, white cloak of the spider, 10 potions of cure serious wounds, ring of the darkhidden, ring of counterspells (cause fear), wand of contagion, unholy symbol. Eklavadra: Female draegloth Clr9; CR 14; Large outsider; HD 6d8+12 plus 9d8+18; hp 84; Init +2; Spd 30 ft.; AC 16, touch 11, flat-footed 14; Atk +17 melee (1d6+6, 2 claws) and +12 melee (1d8+3, bite); Face/Reach 5 ft. by 5 ft./10 ft.; SA rebuke undead 3/day, spell-like abilities; SQ acid resistance 20, cold resistance 20, drow traits, electricity resistance 20, fire resistance 20, immunities, outsider traits, SR 20; AL CE; SV Fort +13, Ref +12, Will +12; Str 22, Dex 15, Con 14, Int 13, Wis 13, Cha 11. Skills and Feats: Concentration +11, Diplomacy +8, Hide +7, Jump +11, Knowledge (arcana) +8, Knowledge (religion) +8, Listen +12, Move Silently +11, Search +12, Spot +12; Blind-Fight, Cleave, Combat Casting, Great Cleave, Lightning Reflexes, Power Attack. Spell-Like Abilities: 4/day -- darkness; 1/day -- dancing lights, desecrate, faerie fire, unholy blight. Caster level 6th; save DC 10. Drow Traits: Eklavadra is immune to magic sleep spells and effects, and she has a +2 racial bonus on saves against enchantment spells or effects and a +2 racial bonus on Will saves against spells or spell-like abilities. She has darkvision (120-foot range) and is entitled to a Search check when within 5 feet of a secret or concealed door as though actively looking for it. Eklavadra also has light blindness (blinded for 1 round by abrupt exposure to bright light, -1 circumstance penalty on all attack rolls, saves, and checks while operating in bright light). In addition, she has a +2 racial bonus on Listen, Spot, and Search checks (already figured into the statistics given above). Immunities: Eklavadra is immune to poison and to sleep-inducing spells and effects. Outsider Traits: Eklavadra cannot be raised or resurrected (though a wish or miracle spell can restore life). Spells Prepared (6/6/5/4/3/2; save DC 11 + spell level): 0 -- detect magic (2), guidance (2), resistance (2); 1st -- bane (2), cause fear, divine favor, protection from good*, vision of glory; 2nd -- body blades, bull's strength, clairaudience.clairvoyance*, death knell, hold person; 3rd -- animate dead (2), deeper darkness, magic circle against good*; 4th -- desecrate, silence, suggestion*; 5th -- cloak of dark power*, obscure object. *Domain spell. Deity: Lolth. Domains: Drow (Lightning Reflexes as bonus feat), Evil (cast evil spells at +1 caster level). Possessions: Unholy symbol, spider rod, wand of web.